Green Packet Berhad's stock is already in an established uptrend. However, it is reaching a resistance area which you need to watch out. The chart above is the daily chart of Green Packet. As you can see, the stock broke out of an ascending triangle bottom and started a new daily uptrend. The stock bottomed when it met its rising 200 MA. The powerful 200 MA once again did its job to bring support to a stock. The ascending triangle pattern is easily spotted as it will have a relatively flat top but with rising lows. Notice how the stock made a higher low. 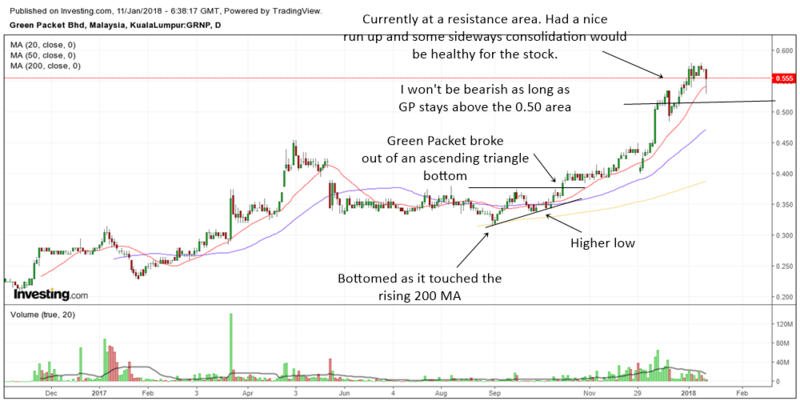 Green Packet is still in a very nice uptrend as it is above its rising 20 MA, 50 MA and 200 MA. This is the characteristics of strong uptrending stocks. 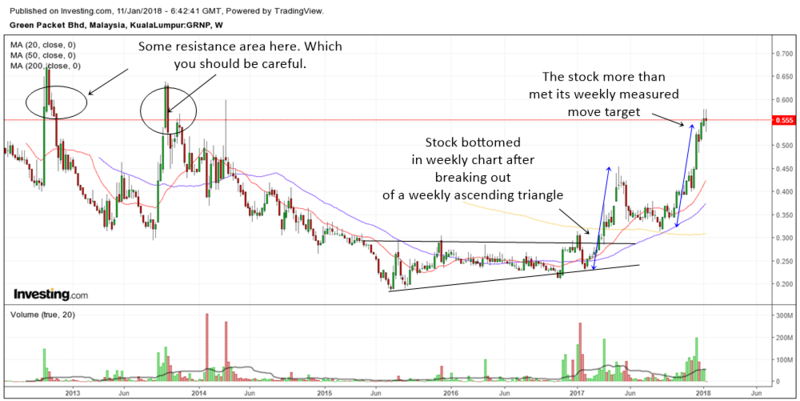 The stock has already have a nice run up and if you look at the weekly chart below, Green Packet is near a resistance area. I am still bullish on this stock as long as it is able to stay above the 0.50 area. When a stock nears resistance, it is usually a good thing to see it trade sideways a bit to rest. Stocks are like human beings. After a nice run, they also need a rest to continue. The sideways trading will also help to absorb resistance and supply on the left. The weekly chart above clearly shows us that Green Packet has more than met its measured move target. In fact it overshot it a bit. After breaking out of a weekly ascending triangle bottom, the stock continued to shoot up with a correction around mid 2017. But as you can see, even the weekly chart of Green Packet is in a uptrend. Therefore, any dips and breakout or continuation patterns are tradeable for the the trader.